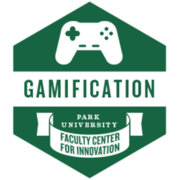 Recipient has applied the knowledge gained on gamification to change some aspect of her/his teaching (inside or outside the classroom). The individual has produced an extensive written reflection and shared artifacts demonstrating the change in practice (i.e. a revised assignment, new grading rubric, enhancement to a course Canvas shell, etc. ).